These days it seems NSA spying, Sony leaks, Federal hacking attacks and Fat Cat CEOs getting away with, well everything, have all made the world a more complicated place to live. 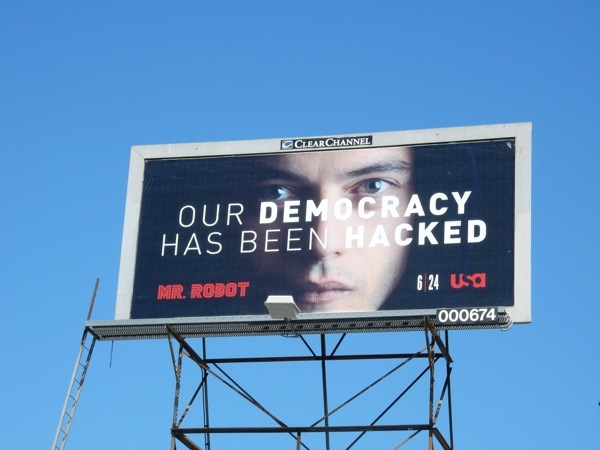 And on TV shows these days you can't swing a cat without finding a hacker character who can't save the day by flying their fingertips over a keyboard cracking passwords, encrypted code and end-of-the-world countdowns. Obviously the time seems right for a crime drama with a hoodie-wearing hacktivist as the show's anti-hero, enter the USA Network series Mr. Robot. 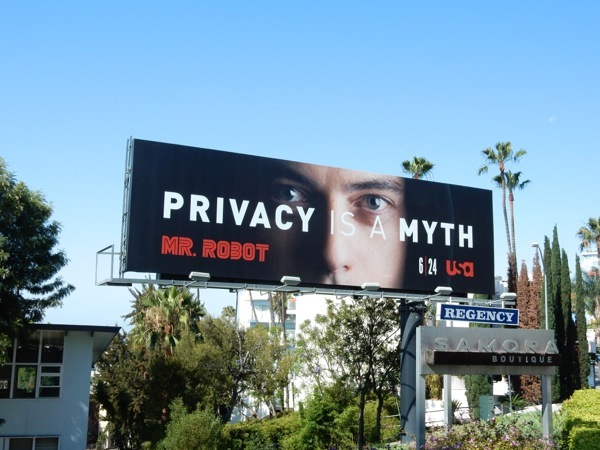 Rami Malek plays the cynical 'Elliot', a cyber-security engineer by day and a hacking vigilante by night, who's recruited by an underground collective of digital-age activists, led by Christian Slater's 'Mr. 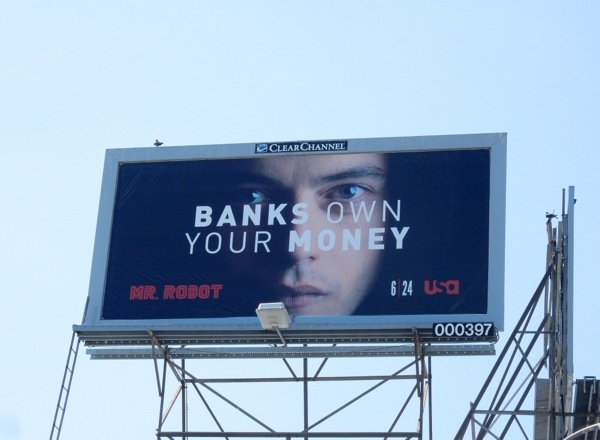 Robot', who want to wipe away all record of global debt and take down multinational companies like the firm he's paid to protect. Talk about a conflict of interests. 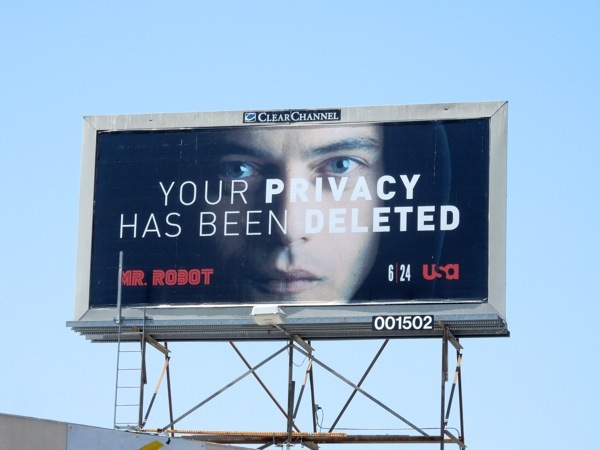 These clever anti-establishment themed billboards for Mr. 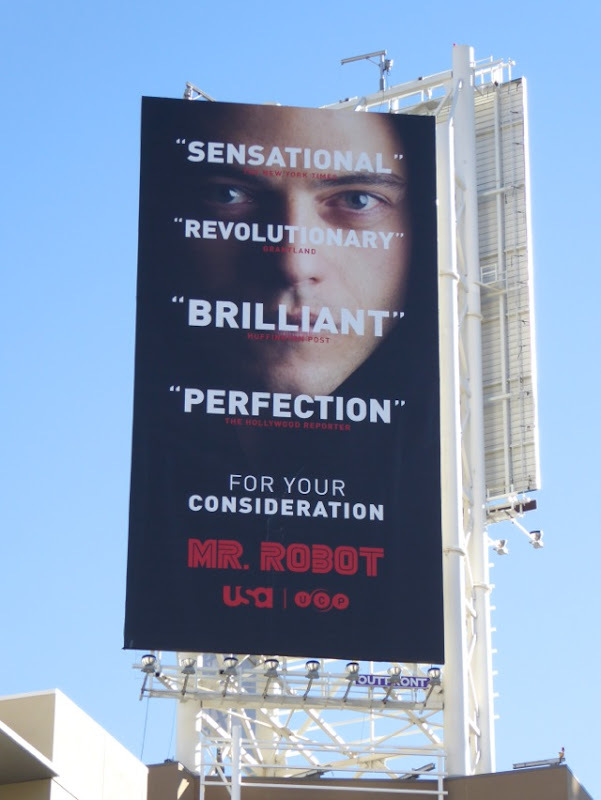 Robot's series premiere are pretty evocative of what many people are feeling nowadays. 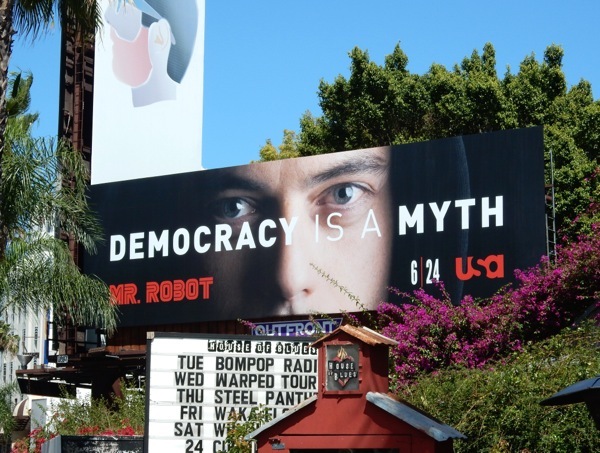 The large landscape billboards were snapped in two locations along the Sunset Strip in West Hollywood on June 7 and June 16, whilst the smaller ads were spotted above La Brea Avenue on June 18 and Fairfax Avenue on June 21, 2015. 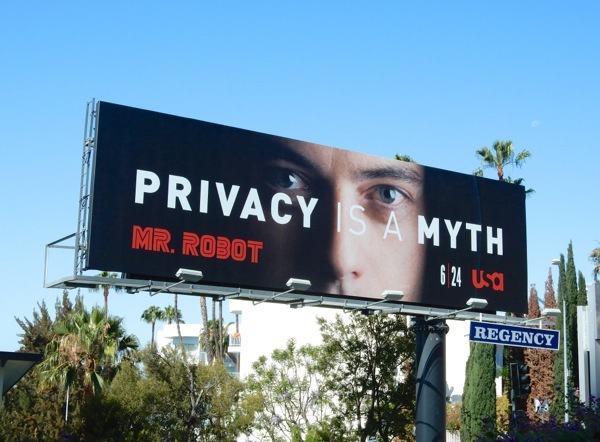 The themes of these ads, and the show itself, reminds Daily Billboard of these Paranoia movie billboards, which actually used the same 'privacy is a myth' slogan in one of its ad creatives. Remember, it's only paranoia if it's not true. UPDATED: Here's another small ad creative in the Mr. 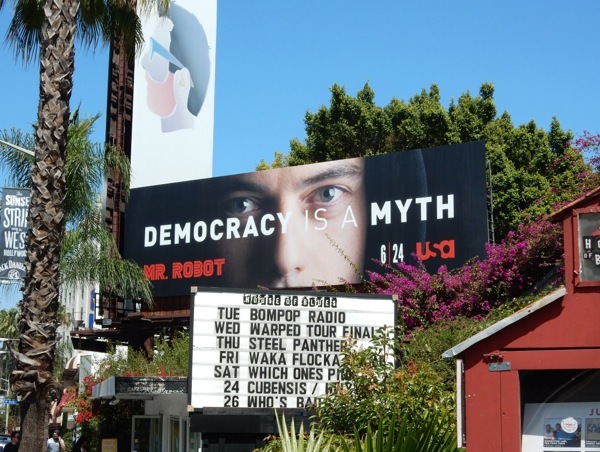 Robot launch campaign, spotted along Sunset Boulevard on July 4, 2015. 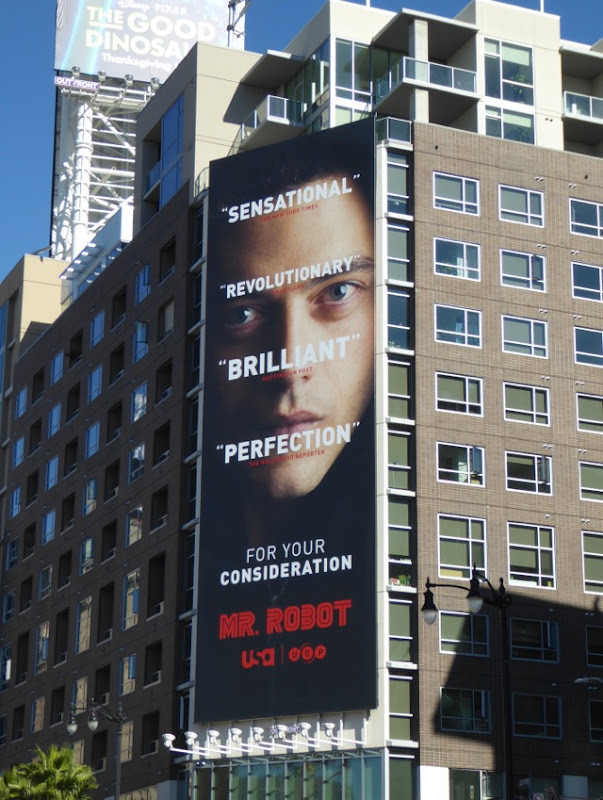 UPDATED: After an acclaimed first season it looks like USA Network really wants Mr. 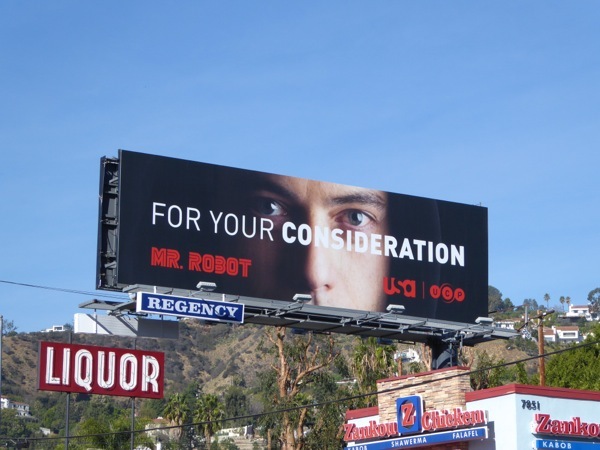 Robot to win some accolades this coming awards season as the campaigning has started in the skies of L.A. already. 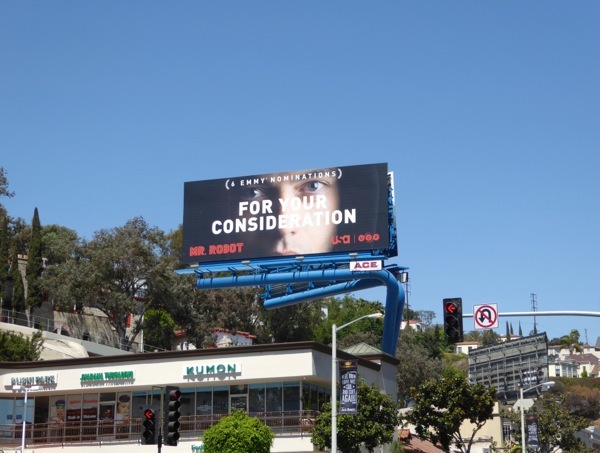 These 'For your consideration' billboards were snapped along Sunset Boulevard and high above Vine Street in Hollywood on November 18, 2015. 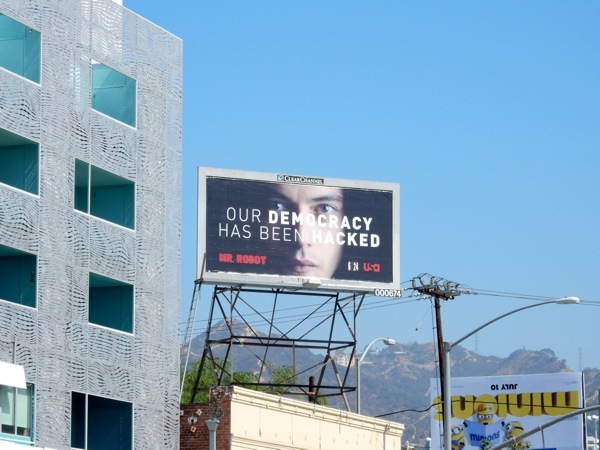 Plus this larger vertical billboard was snapped standing out near Hollywood's Sunset & Vine on December 2, 2015. UPDATED: Mr. 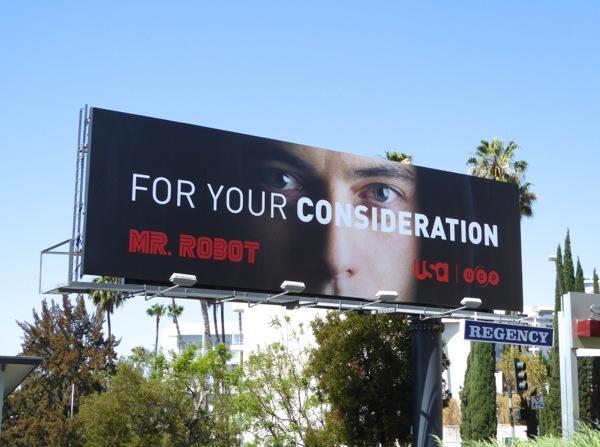 Robot recycled their Golden Globe consideration billboards for their freshman season Emmy campaign, like this one spied along the Sunset Strip on June 20, 2016. 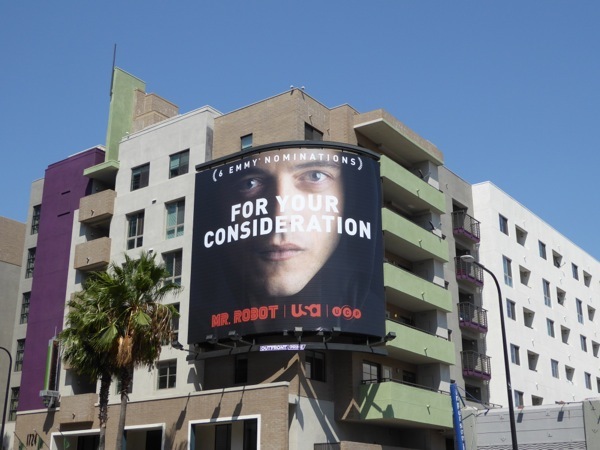 But for their Emmy nomination billboard, spotted further west along Sunset Boulevard on August 11, 2016, they've slightly amended the first season key art to include their six Emmy award nominations. 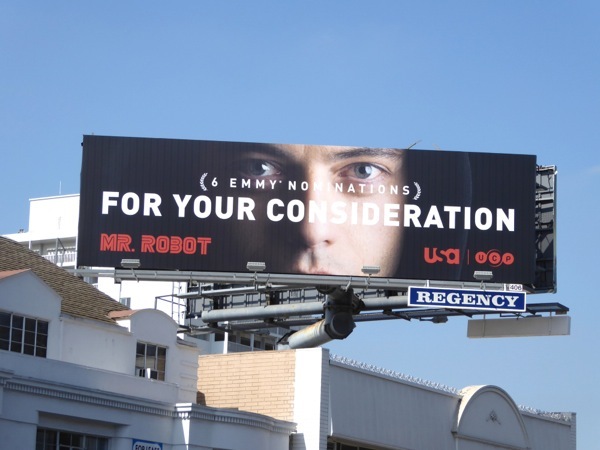 Plus here's another slightly different Emmy nomination ad creative also spied high above the Sunset Strip. And another squarer full face version snapped at Hollywood & Highland on August 23, 2016.